Daily Digital Profit is company founded by professional traders and analysts, specialized in fast growing sphere of cryptocurrency trading. Having more than three years of successful experience on the market, we have decided to attract investment to increase the trading volume, to guarantee our investors daily profit. We consider that, each person even far from computer technology, should have a possibility to earn on it. Join us to look to the future with confidence! The amount of 10 USD has been withdrawn from your account. 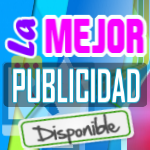 Accounts: U4222871->U18911565. Memo: Shopping Cart Payment. 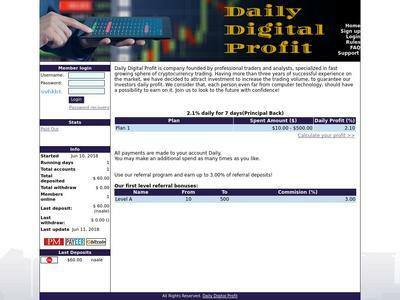 Deposit to Daily Digital Profit User nelomota.. Date: 22:21 11.07.18. Batch: 220874681. The amount of 0.21 USD has been deposited to your account. Accounts: U18911565->U4222871. Memo: API Payment. Withdraw to nelomota from Daily Digital Profit.. Date: 11:06 13.07.18. Batch: 221007372. The amount of 0.21 USD has been deposited to your account. Accounts: U18911565->U4222871. Memo: API Payment. Withdraw to nelomota from Daily Digital Profit.. Date: 11:30 14.07.18. Batch: 221099304. The amount of 0.42 USD has been deposited to your account. 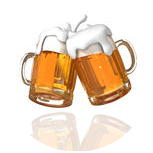 Accounts: U18911565->U4222871. Memo: API Payment. Withdraw to nelomota from Daily Digital Profit.. Date: 18:34 16.07.18. Batch: 221298654. The amount of 0.21 USD has been deposited to your account. Accounts: U18911565->U4222871. Memo: API Payment. Withdraw to nelomota from Daily Digital Profit.. Date: 09:26 17.07.18. Batch: 221350831. The amount of 0.21 USD has been deposited to your account. Accounts: U18911565->U4222871. Memo: API Payment. Withdraw to nelomota from Daily Digital Profit.. Date: 22:37 17.07.18. Batch: 221417309. The amount of 10.21 USD has been deposited to your account. Accounts: U18911565->U4222871. Memo: API Payment. Withdraw to nelomota from Daily Digital Profit.. Date: 22:22 18.07.18. Batch: 221511305. The amount of 0.21 USD has been deposited to your account. Accounts: U18911565->U4222871. Memo: API Payment. Withdraw to nelomota from Daily Digital Profit.. Date: 22:58 22.07.18. Batch: 221868008. The amount of 0.21 USD has been deposited to your account. Accounts: U18911565->U4222871. Memo: API Payment. Withdraw to nelomota from Daily Digital Profit.. Date: 20:50 23.07.18. Batch: 221961827. The amount of 0.21 USD has been deposited to your account. Accounts: U18911565->U4222871. Memo: API Payment. Withdraw to nelomota from Daily Digital Profit.. Date: 20:25 24.07.18. Batch: 222062101. The amount of 0.21 USD has been deposited to your account. Accounts: U18911565->U4222871. Memo: API Payment. Withdraw to nelomota from Daily Digital Profit.. Date: 22:14 27.07.18. Batch: 222376396. The amount of 10.21 USD has been deposited to your account. Accounts: U18911565->U4222871. Memo: API Payment. Withdraw to nelomota from Daily Digital Profit.. Date: 21:37 28.07.18. Batch: 222469572.